11's Saturday Late Show Chiller Theater? pizza parties, and good times. It's Time Once Again For Chiller Theater! 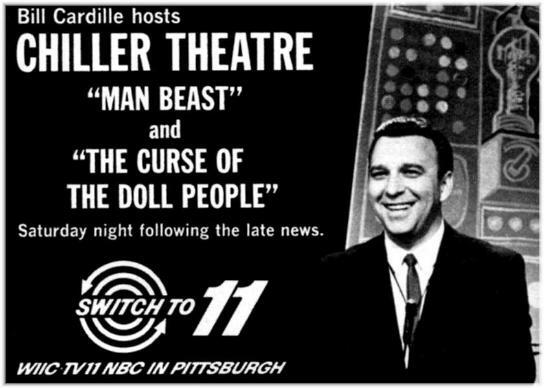 Theatre" premiered on WIIC, Channel 11 in Pittsburgh. shown on Sunday night as well. moved to Saturday night following the 11:00 p.m.
featured "It! The Terror From Beyond Space"
followed by "The Screaming Skull". signoff, "Good Night and Sleep Warm". with a 1:00 a.m. start time. "It Came From Outer Space". 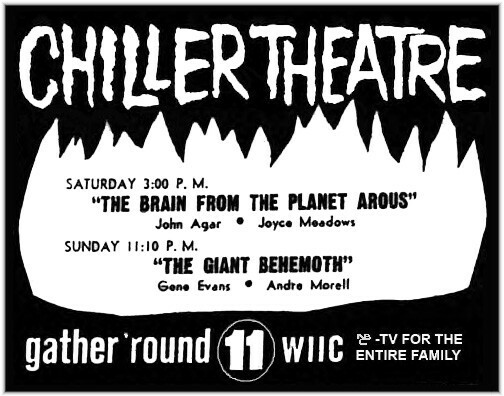 memories of watching Chiller Theater. Thank you Chilly Billy! hosting "Night Of The Living Dead". appeared on the show from 1964 through 1983.